That’s 2 for 2 from the Mixt Box! How is it that you found me the perfect fit jeans again? How do they do it? These are literally the comfiest jeans! Well these and the last pair they sent. Just wanted to show u some more goodies they’ve sent as well. This is my first time wearing a choker since maybe grade 9? How are they back in style? So insane…. either way I’m on the band wagon and have worn every single one of these already, and loooove them! 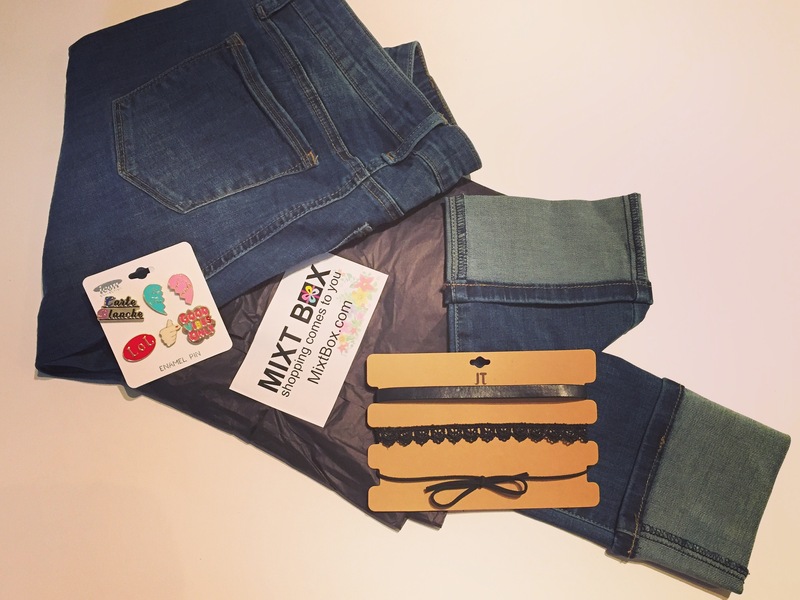 Thanks Mixt box for keeping me stylish! Also got some cute enamel pins, love the best friends one. I had those in grade 3-5 with necklaces and bracelets, too cute. Just give the Mixt Box your style preferences and measurements and let them send you a box full and I mean FULL of clothing items to suite your body type, measurements and style! I was so excited to have my own personalized shopper and can’t believe how on point they were with some of the items they sent. You can expect 10-15 items, maybe a dress, jacket, pants, shirt, accessories, all sorts of stuff! I love trying it all on and modelling it! Overall I’m in love with this subscription and would love to see all you ladies try it out. Don’t like an item? Just send it back! You only get charged for the items you keep! Love it all and want to keep everything? Bonus! You get an extra 20% off if you decide to keep it all! Nothing better than your own personal shopper, and so impressed with all their selections for me. The more you provide them the better it will be too, let them know your style, what items you might be looking for and just let them take care of the rest. Free shipping too, both ways! No styling fee either! You can even choose some items from their online store. Another awesome thing is that you can send them your gently used clothing back for 10% off your next purchase and they send these clothes to the Dress for Success Foundation which helps women back up on their feet. Love a good cause!